This issue opens up with a fight between Batman and Killer (or maybe not so killer) Croc as witnessed by the gang. During this battle everyone runs except for Olive who stands transfixed in her position. As the fight continues Killer Croc accidentally sets off fireworks which set the hall on fire. Killer Croc then saves Olive from a burning beam that would have crushed her. Killer Croc then leads her to safety through the sewers. It’s then that we learn more about Killer Crocs connection with Olives mom, and more back story into who she actually is. After Olives discussion with KIller Croc he swims off into the sunset and she meets back up with the gang, who tell her that she needs to get cleaned up. After a brief flashback scene Olive has a close up encounter with batman himself. He tells her a bit more about her mother and that she needs to be careful. To which she responds that he ruined her life. For the rest of the story, go buy the issue! I will say that there is a surprise reveal at the end of the book, and when Gotham Academy returns in June (after DCs Convergence event), their will be a new student enrolled in Gotham Academy. This series continues to be a strong addition to the DC line. As someone who doesn’t know much about DC lore I was excited to learn a bit more about Olives mother. The writing by Cloonan & Fletcher continues to be a strong point. Time after time this series manages to make me feel a connection to the characters, on an emotional level. I actually care what happens to them, and what has happened to them. I feel a sense of attachment to the characters, and in that way I have a vested interest in the outcome of each issue. The art was beautiful as usual. The palette that was used gave stark contrasts between night and day which made the passage of time easy to track. The design for Batman paid homage to a more classic batman look. With the blue cape and hood and the yellow utility belt. I have to say for me, this is my favorite Batman look, and I loved the art job on him in this issue. Gotham Academy #6 did a good job of setting up for the future and now June can’t come fast enough. A week ago after Indiana Comic Con my best fried drove me around to a couple of shops in Indianapolis (Indy). My favorite of which was Comic Book University (CBU). Located on the South side of Indy, CBU is a gem nestled inside a strip mall next to a chinese buffet and a fast food restaurant. For ease of reading I will separate this review into three sections: Space, Selection, and Price. 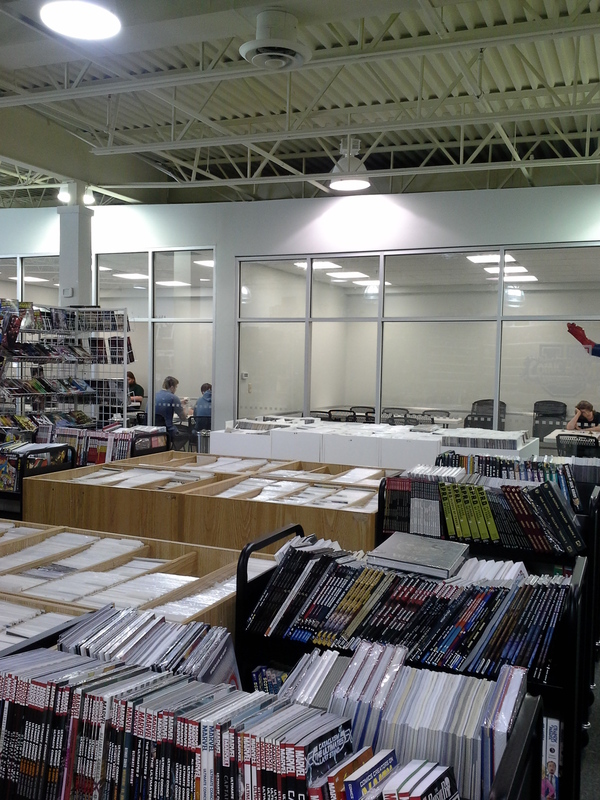 CBU offers a large space full to the brim with comic book related items. They have shelf after shelf, and table after table. 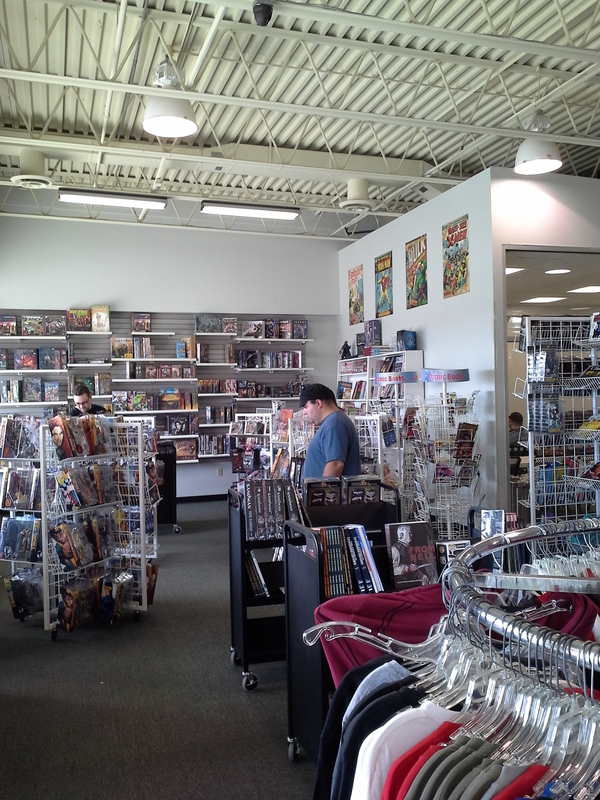 In the back of the store they have two large rooms where they have DnD tournaments, and magic tournaments. I really like the rooms because the front of them are glass so you can look in and watch whats happening. It gives it a cool feeling. Overall the space is nice, but sometimes all the tall shelves can make it seem a bit crowded. Now this is where I think CBU thrives. They have a huge selection. 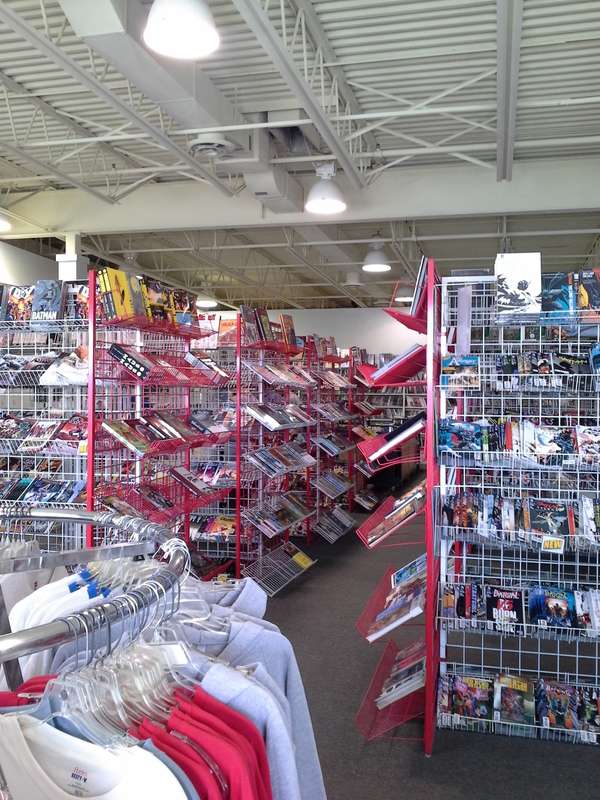 Not just in new releases, but also in back issues and in trades, and other merchandise. CBU has a whole corner for board games, expansion packs, and other items for your gaming needs. I was really impressed with great selection. As far as new issues go they had a huge selection, from the big two down to much smaller presses. Another thing I liked about the selection was not only did they have a wide range, but they also had a lot extras of each issue. That way you didn’t have to worry about getting there at 7am to get the one issue of the obscure comic you’re obsessed with. As you can see from the pictures they also had clothing that you could buy with your favorite heroes on them. I think part of the problem that I have is that I’ve been spoiled by my local comic shops prices (which are insanely cheap). While CBUs prices aren’t outrageous, they aren’t especially good either. New issues are cover price, as well as trades. Board games were a bit on the pricey side (although they do have sales!) as were the T-Shirts. The biggest issue (all puns intended) I had with the pricing were the back issues. The cheapest back issues that I could find were $2.00 ranging up to $10. While that’s not ridiculous, I could find better/same pricing on similar comics other places. They also didn’t have a discount bin that I could find. This added up to a fairly expensive trip for me and I only purchased two comics. When the character Silk was first introduced, back in Amazing Spider-man #4, I had no idea what to expect from her. When I found out about Spiderverse I assumed she was just a character that was created for that event and would be of no major significance. When I heard she was going to have her own series I assumed that it was just an attempt to cash in on Spiderverse, and that it would just be a tie-in (or fall out) book and not contribute much of anything *cough first 5 issues of Spider-Woman cough*. It turns out all of my assumptions were wrong. On a whim I picked up the first issue of Silk and much to my surprise enjoyed it. Silk is a likable character who has her own unique voice and way of communicating with the reader. Issue 2 cemented this series in my pull list. Silk #2 opens up with an inner monologue from Silk about how she thinks she has adjusted well to the superhero life, right before she is grabbed by a giant head skull machine with an indeterminable amount of tentacles (ahhhhhh!!!). The scene then shifts back to an hour and twenty minutes(ish) earlier where we see Silk trying to survive her job and find her family that has mysteriously disappeared. I wont give away anything else that happens, so go buy the book! Robbie Thompson does an excellent job giving Silk her own distinctive sound and feel. He makes her unlike any member of the spider family we have seen recently (which with spiderverse has been a lot). The pacing for this book is excellent, and I really like the way he ties the ending back to the beginning of the comic. It makes it feel like its gone full circle and gives me a sense of satisfaction. The art by Stacey Lee is superb. I have enjoyed the cartoon-ish feel, along with the interesting character design. The colors by Ian Herring are breathtaking. I strongly feel that Silk owes a lot of its success to the fantastic coloring job done by Herring. The color palette he works with increases the overall aesthetic of the book, and carefully balances the “Fun” and “serious” aspects of the issue. One thing I really enjoy about this series is it feels like a throw back to a teen-aged Peter Parker. As the Peter Parker has dealt with increasingly more adult problems he’s lost some of his child like wonder, and with it some of his appeal (at least to me). Silk brings that back, and for that reason it’s my pick of the week. This past weekend I had the pleasure of attending Indiana Comic Con. This was my second year in a row of attending this event. Last year my main complaints were it was slightly disorganized, they didn’t have enough room, and the guest list for the event was underwhelming. This year the powers at be took steps to reconcile these problems. There were still some issues, but overall this year was better than last year. For convenience I will break up my review into sections to be reviewed: Venue Space, Guest Creators, Media Guest, Organization, and Affordability. As I stated earlier, space was a problem that Indiana comic con (ICC) had last year. ICC sought to fix this problem by renting out 3x the space for this years con. This for the most part solved this problem. The booths were not as close together, and despite a larger turnout there was more space to move around than before. I would say on this front ICC was very successful. Aside from a larger main hall, there were also more rooms for panels and other events. They had a hall rented out for attendees to play board games, and a cinema area where they played movies all day, Overall ICC did a great job of addressing this glaring issue from last year. This year ICC featured a good amount of guest creators. The highlights were: Mike Zeck, Jim Steranko, Denny O’Neil,John Beatty, Philo Barnhart, Mark Waid and Ryan Stegman. Of this list I personally met Zeck, Beatty, Waid, and Stegman. Of all the creators I met Stegman was the nicest. He was very interactive with me while he made a sketch, and seemed genuinely interested in what I had to say. Waid was also very nice. One thing I didn’t like was that both Zeck and Beatty charged for their autographs. IF they had been a massive star like Matt Fraction, or Alex Ross I would have understood, but as it was it was a little annoying to have to pay almost $20 to get my comics signed on top of my entrance fee. The over all quality of the guest creators could have been improved by having a few more current creators there. I know it’s hard for a new con to attract some of the big names, but I feel like they could have at least gotten a couple more “B” level creators. Maybe if they had had less Media guests they would have had more of a budget for that. This years media guest list had a little bit of everything, and a lot a bit of one thing. First what was wrong:This con had an over abundance of voice actors. (10 to be exact). This number should have been reduced to accommodate a wider audience. The rest of the media guest list was pretty solid. It included: Carrie Fisher, Jason Mamoa, Jenna Coleman, and Rory McCann. They also had Willon Shields and John Rhys-Davies cancel on them at the last-minute. Scoring Carrie Fisher was a big win for ICC. She was by far the most popular media guest, and her line proved it. Despite a high price per autograph and photo-op her line felt like it never shrank. Jason Mamoa and Jenna Coleman both had a very long lines as well. One complaint I heard from a lot of people was that Carrie Fisher actually ran out of time to sign all of the autographs that were sold. Although most of this list didn’t appeal to me, and in my opinion they had waaaaaay to many voice actors, they did a good job of trying to find people who would appeal to a wide audience. Organization for this years ICC was better than last years. However it still was sorely lacking. They did not have enough workers stationed around to direct guests. The program they handed out did not have numbers or letters on the pictures to show what room number things were in. They had waaaaay to many lines for no reason. As I stated before they way over sold the Carrie Fisher autograph and photo-op tickets. From what I’ve heard they didn’t have any problems with the other media guests. They needed to have workers at the photo-op lines to make sure that things stayed organized. My big beef with the organization was the fact that they had a line outside of the main convention hall where you could buy tickets for an autograph, but you could also buy the same tickets while you were in line. This led to way to much confusion, and way to many angry guests. Organization needs a lot of work for next year, although I am encouraged with the direction it’s moving in. The price of admission for ICC was $35 for one day, and $60 for a three day pass. I purchased the one day pass. Compared to other cons of equal or slightly larger size this is a great price. The charge for the media guest was $75 for Carrie Fisher, $50 for Jenna Coleman, and $40 for Jason Mamoa. Overall the prices for media guests were reasonable, although I wouldn’t have paid $75 for an autograph from Carrie Fisher. The vendors at ICC all had decent deals for the con and most were willing to haggle with you. Several booths had $0.50 comics and even more had $1.00 comics. The close food locations all had decent prices for their food and I only spent $11 on food. Parking was $25 for the whole day. This was steeper than I expected an I think in the future they should think about setting up some special parking at a lower rate. One think I didn’t like was, as I stated before, Mike Zeck and John Beatty charged for their autographs. It was an extra $20 that I hadn’t planned on. The price of ICC compared to other cons of equal size was still low and I would recommend it to people who are looking to go to a con on a budget. All in all ICC was a very fun experience. I really had a great time. The venue space was big enough to accommodate the number of people who showed up. The guest creators were nice and interactive. They had enough media guests to reach a wide audience. The organization needs work, but I am encouraged by the improvement from last year. ICC is also a very affordable con for attendees who are on a budget. ICC has promise, it is going through some growing pains, but I really believe it can emerge as a big player in the Mid-West Con scene. This week many heavy hitters were released. Amazing Spider-man, Silver Surfer, Thor, Marvels relaunch of Howard the Duck, just to name a few. However in the end it’s Becky Cloonan and Andy Belangers’ creator owned Southern Cross that takes the Number 1 spot. Southern Cross is a story in a futuristic setting where our protagonist, Alex, is traveling by space ship (the Southern Cross) to the planet Titan in search of answers. We learn that Alex’s sister has died under mysterious circumstances on Titan, and Alex is determined to discover what really happened. In order to get to Titan Alex must first endure a six month journey on the Southern Cross, along with a roommate who may not be what she seems, and a crew that pose their own set of mysteries. Cloonan does a fantastic job of quickly crafting characters that are compelling and complex. Almost every single character we are introduced to appear to have something more to them than meets the eye. Even Alex herself has a checkered past and questionable motives. I’ll keep this review spoiler free, but lets just say nothing in this story is strictly black and white. The art by Andy Belanger is spectacular. He crafts a world that is as visual appealing as it is complex. Every page hides a hidden wealth of detail that begs for a second, third, or even fourth glance. The coloring choices by Lee Loughridge are excellent. I really enjoyed the use of various color shading to really give the scene a realistic feel. It felt as if the dark blues, greens, purples, were pulling me out of my bedroom and onto the cold metal of the Southern Cross. Lee’s use of different colors for different sections of the ship also helped organize the ship in my mind. Providing a nice visual aide to the story. Overall Cloonan and Co. debut a fantastic new world with a fresh story that leaves me wanting more. I highly recommend that you go out and buy this comic if you haven’t already. If you enjoy sci-fi or horror comics, you won’t be disappointed. When I went to the comic store today I had completely forgotten about this book. I had preordered it two months ago and put it somewhere in the black hole that is the back of my mind. I am so glad that I had preordered it, because it is a sheer delight from start to finish. Jeff Lemire is in charge of the script for this issue and he delivers. The concept is sci-fi adventure set in a galaxy with 9 core planets that are referred to as the United Galactic Council (or UGC for short) the hub planet of this core is called Niyrata. Suddenly, above each planet a giant robot appears. On Niyrata a leading technology expert, Dr. Jin Quon is called upon to investigate these robots. As he begins to examine the robot stationed above Niyrata the robot attacks. The scene then flashes forward 10 years to a child companion robot whose robot line was created by Dr. Quon. This child companion robot seems ordinary, but could there be something special about him? Ill leave that for you to find out on your own. The art by Dustin Nguyen is simply breathtaking. He works with watercolors on a beautiful color pallet to craft a world that, despite its slight dystopian feel, is beautiful.The splash page 3 pages in features our first look at the giant robot and is stunning.The texture and shading that he brings out is nothing short of extraordinary. Also as equally impressive to me is Ngyuens work with facial hair. In the book several styles of facial hair are displayed, and all of them are unique and interesting in their own way (as odd of a thing as that is to notice). The art is so good that even if the story component wasn’t good I would still buy this book. There are not enough words I can write to do it justice. If you didn’t pick this up this week then you are missing out on one of the best debuts for a comic I have ever read. This weeks trip to the savings bin brought me The Silver Surfer vs. Dracula (SSvD). First published in 1993, SSvD is a tale that is as convoluted as it is unnecessary. The first five pages feature Dracula deciding that cretins aren’t worth his time, appearances by Blade and Deacon Frost (who have a fight and then are never mentioned or shown again), and a summoning of a very angst-y Silver Surfer. We learn that a mysterious group of five want Dracula dead because there is “no need of him anymore”. The only problem is that they need someone mighty enough to challenge him, so logically they draft the first person anyone would think of…The Silver Surfer. Upon summoning him they knock him out with “a mystic force” and then brain wash him, while he is unconscious, into thinking that Dracula is the greatest evil of all time. When the Surfer awakes he feels compelled to find this “Dracula” and dispose of this evil. 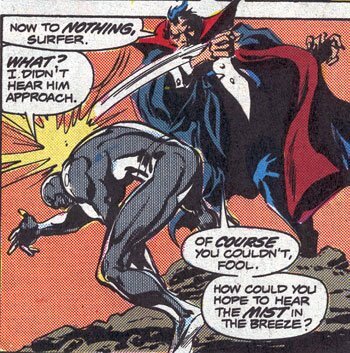 Conveniently, and unexplained, The Surfer knows exactly Where Dracula is and confronts him. In the ensuing battle we learn that Dracula can control weather (ok that’s new), and animlas (what?). Both of these forces he uses against the Surfer in an attempt to appear like a foe that could potentially harm him (which he’s not). All of this torrid action culminates in a physics defying punch by Dracula that knocks The Surfer to the ground. At this point I was thinking “alright, time to use some of that power cosmic and send a power blast into his chest”. Instead The Surfer and Dracula decide it’s a tie and Dracula Bat-forms and fly’s away. Wait, what? The Surfer is endowed with the power cosmic, he was the herald of Galactus, he held his own against the entirety of the Fantastic Four. He once stood eye to eye with Thanos, and yet one gust of wind, an attack by a small clan of rats, and one punch from Dracula is enough for The Surfer to call a truce? Yeah, I’m not buying it. They tried to explain it by saying that he was “sluggish” from the brain washing of the mysterious five, but even still he should have been powerful enough to finish off Dracula. C’mon. Throw in uninspired art, dialogue such as “Dracula needs sustenance this night, and you shall supply it”, and several glaring grammatical issues and you have what may be the worst comic I have ever read.The best part of this comic was the Howard the Duck short story in the back. Perhaps in the early 90s Dracula was more popular than he is today. Maybe this was just an attempt for a cash grab. It sure feels like one. There’s no way I would have ever payed the original $1.75 cover price. I paid $0.50 and I still feel robbed.